Bring your public speaking to a whole new level! » Do you need to define and clarify key messages that can be effectively carried across a variety of communication platforms? » Are you looking for insights and direction on how to engage, influence and persuade your audience? » Do you want to learn how to create content that connects, tell stories that stick and deliver it with dynamite impact? Then Boring to Brilliant! is for YOU! 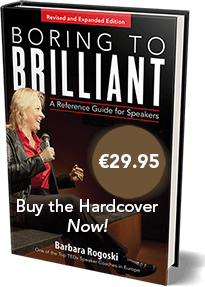 This insightful, image rich speaker’s guide is full of powerful tips and techniques you can integrate right away into your next public speaking event. The guide is a handy business tool you will want to keep on your desk or in your briefcase to refer to over and over again. Post Speech Review Document – Do Better the Next Time? What is a Servant Speaker? 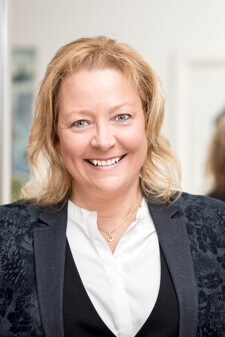 Barbara Rogoski is an American Executive Speaker Coach who specializes in helping non-native English speakers to present confidently in English. Her unique “no blah-blah” style of coaching and confidence building has been implemented on stages all around the world. Her passion for her clients empowers them to speak their truth and make a difference. Barbara’s talent is in bringing out that greatness in every speaker and every speech. One of her greatest passions is TED, the organization that allows innovators a platform to share their ideas on how to make the world a better place. 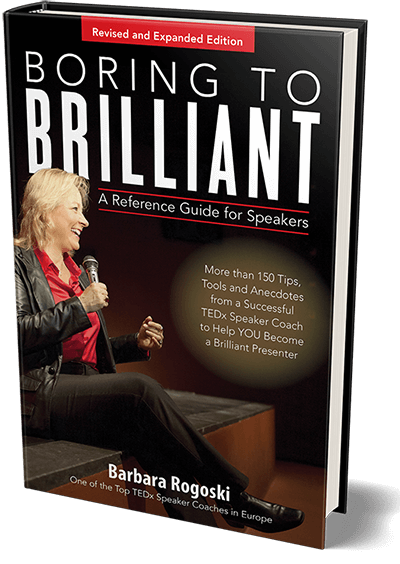 Barbara has coached more than 140 TEDx speakers to present their ‘ideas worth sharing’ to the world. The result of these many hours of coaching, has led her to write the Boring to Brilliant! 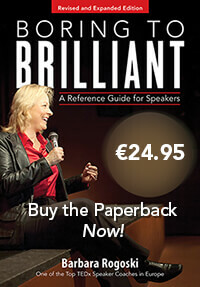 A Speaker’s Guide with her passion and enthusiasm showing through on each page. This unique book offers 101 practical tips, tools and anecdotes with visual concepts for each tip instead of a lot of blah-blah text. There is no other speaker’s guide like this one. Barbara is the Public Speaker’s Best Friend!